Almost 50 million citizens have disabilities, and the likeliness of a disability rises with age. Meanwhile, nearly one-quarter of the workforce will be 55 or older by 2018. At the same time, mobile devices that are smaller than the typical desktop computer and require more dexterity to operate are becoming more common in business. As Windows 8 straddles the desktop-mobile divide, it will include assistive technologies optimized for touch-enabled devices, and built to be easier for easier integration by developers. Microsoft's Building Windows 8 blog on Tuesday said the new OS will include improvements to help users with physical disabilities, including vision, mobility, hearing and cognitive impairments. In the post, Jennifer Norberg, lead project manager of the Human Interaction Platform team, focused on the underlying assistive-technology changes to Windows 8, and specific changes to serve users with vision impairments. Narrator reads what you touch, and is activated when you make a secondary tap. The most important change is the adoption of industry standards, including those from the Web Accessibility Initiative, Accessible Rich Internet Applications, HTML5, and XAML. Norberg's post notes that in previous versions of Windows, vendors had to use "different 'creative' ways of getting information from the system," making it difficult to add assistive technologies to apps. Providing a standards-based “accessibility foundation” for developers to build on will make it easier to add ATs to apps, which should expand their use and result in a larger number of apps being accessible. Narrator, a text-to-speech screen reader, was first introduced in Windows 2000 as a way for users with vision impairments to read on-screen elements such as dialog boxes. Windows 8 promises to improve Narrator by making it more responsive, able to read more controls, and able to support more languages. 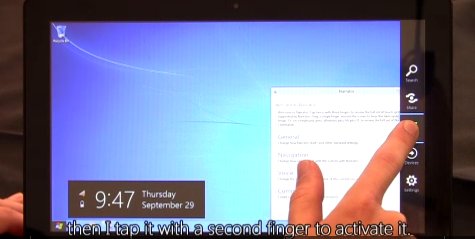 On a touch-enabled device, pressing the Windows logo key and volume-up button starts Narrator, allowing users to explore any part of the screen with a finger, while Narrator reads a description of the elements under the user's finger. Tapping the screen with a second finger activates the element. Borders work like scroll bars to allow zooming and panning. Magnification has been around since Windows 98, allowing low-vision users to enlarge areas of the screen for easier viewing, but it doesn’t work well on touch-enabled devices. Dragging the screen around with your finger results in your hand blocking what’s behind it. With Windows 8, Magnifier will place a border around the screen that looks and behaves much like the scroll bar on a long window of text. The corners of the screen contain + and - boxes that allow zooming in and out, while dragging along any of the borders pans the screen left-to-right or up-and-down. When a border disappears, it indicates that you’ve reached that edge of the screen. Touch the left and right border at the same time with your thumbs, and a preview screen shows where you are and allows you to drag the focus to a different location.